With a full day to explore, get an authentic insight into life in Bangkok with a like-minded local by your side. Dive in to Bangkok’s vibrant and exciting culture as you discover the city’s most iconic attractions as well as getting a taste of local life in off the beaten path neighbourhoods. Your experience will be fully personalised to include the famous sites and areas you’d most like to see, but your Local Host will also show you the hidden spots and share stories along the way that you’d struggle to find in a guidebook. With a full day to explore, and a local friend to guide you, you’ll be able to create your perfect day in Bangkok! You could start the day with your Local Host taking the Chao Phraya Express Boat to Tha Chang to explore Bangkok’s oldest district, the artificial island of Ko Rattanakosin. 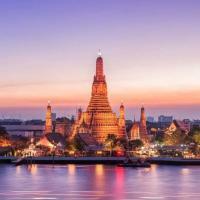 Here, you’ll get an introduction to Thailand’s traditions and must-see temples, Wat Phra Kaew and Grand Palace, Wat Pho and Wat Arun. Finding the best, most authentic Thai cuisine can be a challenge, so your Local Host will help recommend extraordinary and unusual dishes that meet your dietary requirements and take you to the spots where locals really eat. In the afternoon you could decide to move to the area of Saphan Taksin, or explore a local neighbourhood with your local by your side to navigate off the tourist trail. Get a new perspective on Bangkok with cocktails in one of city’s best rooftop bars and get recommendations for dinner at one of the many unique restaurants. 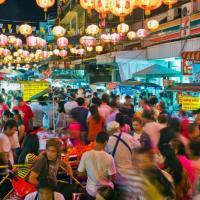 After dinner, head to one of Bangkok’s night markets or explore an area (in)famous for its nightlife! Our Local Hosts can all speak English, but many also speak Thai, Indonesian, Laos and many other languages so that can connect with you culturally as well as with your personality. * Join a like-minded Local Host to explore the city and see its most famous attractions and immerse yourself in Bangkok’s unique culture. * Find the best, most authentic Thai cuisine, your Local Host will help recommend extraordinary and unusual dishes. * Explore a local neighbourhood with your local by your side to navigate off the tourist trail. * Get a new perspective on Bangkok with cocktails in one of city’s best rooftop bars or get recommendations for dinner at one of the many unique restaurants. * Get familiar with the best ways to navigate the city. 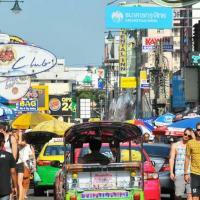 * Ask any questions you have about exploring Bangkok and where to visit. 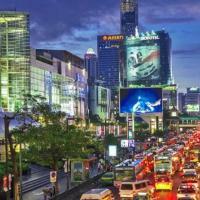 My girlfriend and I had an awesome tour with Zarut, it was our first time in Bangkok and he did a perfect job of showing us the city the way we wanted to experience it. I would highly recommend him as a tour guide and we hope to see him again one day! Very good guide. Knowledgeable, easy to talk with, knows the area well. Would highly recommend. We went to Grand Palace, Reclining Buddha, Temple of Dawn. Amazing experience and Zarutt Khun was an incredible guide. Very attentive and knowledgeable. Would recommend him for future travellers. Zarut was personable and very knowledgeable about his way around and the history and other information about Bangkok, that we wouldn’t have known on our own. He gave us a preview of the day’s plan and have considered our interests , expectations and our time frame. We experienced a daily commute of a local in the city which was a good experience. He took us to the tourist attractions that we requested. He shared a lot of information with us about his city. He recommended a good restaurant that we ended up having dinner and enjoyed it a lot. Thank you for a great experience!